More than 35,000 people from around the world gathered in Quito in October to celebrate the adoption of a New Urban Agenda, and an estimated 20,000 people convened in Marrakech two weeks ago for COP22. The events and dialogue that took place in Quito and Marrakech brought to light the crucial role mobility and transport must play to reach a sustainable future. Habitat III and the New Urban Agenda brought significant attention to issues of equality, inclusion, gender and participation, making the case that the international community will not be able to achieve its aspirations without true inclusion. COP22 convened nearly 200 countries to advance implementation of the Paris Agreement, reached at COP21 in Paris last December. Like the Sustainable Development Goals (SDGs) – in particular Goal 11 on sustainable cities—the New Urban Agenda reflects the need for greater access to mobility for all people. During Habitat III, the transport sector factored large, organizing more than 30 events to raise awareness of the importance of investing in low-carbon infrastructure and creating enabling policies and projects. These events centered around making transport more equitable and accessible, in particular for the urban poor, women and for those with disabilities. 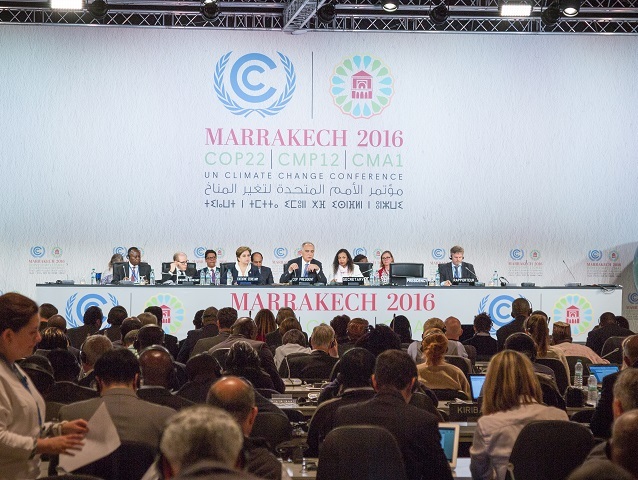 COP22 saw a similar commitment to the transport sector, with over 30 transport-oriented events, including a high-level ministerial round table and Transport Day, hosted by the Paris Process on Mobility and Climate (PPMC) and SLoCaT. One key message that resonated throughout the events in Quito and Marrakech was the need to link the SDGs and the New Urban Agenda to the global climate agenda, particularly the Paris Agreement. Ensuring that everyone benefits from progress made in sustainable development will prove to be the next challenge for these global agreements. Given the rapid urbanization occurring across the planet, acting on climate commitments will be inseparable from making cities more environmentally sustainable and socially equitable, where all people have access to mobility options that connect them to opportunity. A clear illustration of how climate and mobility are interconnected can be found in social housing that is built outside of cities, in locations with low access to jobs, services and livelihood opportunities. For example, in recent decades, more than four million houses were built in the outskirts of Mexico City, leading to long travel times, and, in some cases, forcing the poor to abandon new developments because of the lack of access to any economic opportunity. These vulnerable groups have also been most affected by air pollution and road fatalities, as almost fifty percent of the 1.25 million road fatalities that occur every year are pedestrians from low-income countries. If we continue down this path of pushing poor people further and further out of the city without affordable transport options, then the world will not be able to achieve its goals to cap global temperature rises and eradicate poverty. Now that Habitat III and COP22 have come to a close, there is an opportunity to continue the conversation about linking these agendas and create a greater sense of urgency. From a sustainable mobility perspective, there will be three key elements where integration needs to happen: The Global Climate Action Agenda (formerly known as the Lima-Paris Action Agenda), the development of National Climate Action Plans (National Determined Contributions – NDCs) and the creation of a mechanism to track and report progress on implementing the Paris Agreement. Last year in Paris, the transport community launched PPMC in partnership with SLoCaT and Michelin Bibendum, which brought together a number of initiatives from civil society organizations, NGOs and business associations to announce their commitment to act on climate change. Many of these initiatives were present in Quito and Marrakech and renewed their commitment by acknowledging the New Urban Agenda during Transport Days at both events. It is vital to continue tracking these initiatives in terms of their impact on reducing greenhouse gas as well as poverty and inequality. Secondly, as of August 1st, 160 countries have committed to action through their NDCs. While more than 75 percent of countries included transport actions in their initial commitments, less than a tenth of them included investments in walking and cycling infrastructure. The majority focused on improving fuel and vehicle efficiency. While fuel efficiency is certainly important for tacking climate change, there is a risk that focusing solely on this area—particularly in poorer countries—will draw attention and investment only to individual motorized vehicles, which a minority of the population actually uses. In order to achieve the SDGs, Paris Agreement and New Urban Agenda, more investment will be needed for walking, cycling and public transit infrastructure. These three agreements all contain requirements to measure and report on future commitments and actions— crucial steps toward realizing a vision for better and more inclusive development. The transport sector has and should continue to serve as a model for other sectors on how to align actions and report on progress. Initiatives including Decarbonizing Transport from the International Transport Forum, the recently signed Memorandum of Understanding between SLoCaT and UN-HABITAT to track the implementation of the New Urban Agenda and the follow-up on the report of Ban Ki Moon’s UN High-level Panel on Sustainable Mobility should make sure that emissions, as well as safety and accessibility, are integral parts of a future tracking framework. While there is certainly momentum on the global level to take action and responsibility towards sustainable and low-carbon mobility, the ultimate litmus test will be how these translate into real, on-the-ground progress covering all three dimensions of sustainability. Now, the world looks to see whether the international community and national governments will move to create new policies and stronger investment, empowering sustainable transport infrastructure and services, as they’ve committed to on the global stage. Only if we see progress towards an integrated approach which provides a pathway for more people becoming empowered through low-carbon sustainable mobility and have access to safe and affordable jobs, education and health services, we can assess if Quito and Marrakech have been successful.